The 14 year reign of Hugo Chávez as President of Venezeula has come to an end with his death at the age of 58. Chávez is a polarising figure; people in the developed world tend either to love him or hate him. There isn’t a lot of nuanced, considered judgement about Chávez on the internet. So today I aim to fill that gap in our collective literature. Let’s find out what, precisely Huge Chávez did for the Venezuelan state and its people, for good or for ill.
As we can see, the worst of the inflation is in the late-80’s and 90’s–there is a comparative improvement under Chávez. Per capita GDP is more than doubled. Infant mortality is nearly cut in half. Extreme poverty is a third of what it was. Oil exports have more than tripled. The murder rate has nearly doubled. Chávez has been unable to break the back of inflation (likely because inflation has been so high for so long that workers and businesses price it in–it has forward momentum). Just by looking at The Guardian, it might look as though Chávez were fundamentally a success, but in order to know this we need not merely to compare Venezuela today to Venezuela in 1999, but the rate at which Venezuela has improved to the rate of improvement in other countries. Venezuela and Colombia are only two spots apart in the GDP league table at $338 billion and $365 billion, respectively. Venezuela and Colombia are not all that far away in per capita GDP either, at $10,600 and $7,100, respectively. Venezuela and Colombia are culturally very similar. Venezuela and Colombia have pursued drastically different development policies–the former very socialist, the latter very free market and US-assisted. This allows us to assess divergent models of development against each other. Venezuela’s rate peaks at around 21% and is now down to around 6%, a net improvement of 15 points. Colombia’s rate peaks at around 18% and is now down to 12%, an improvement of 6 points. Advantage Venezuela. Colombia has a fundamentally stable currency, but it’s important to note that it started from a much easier position. While Venezuela experienced triple digit inflation in the 90’s, the highest rate of inflation seen in Colombia in recent history does not even break 50%. Also notable is the fact that the Colombian rate hasn’t been over 20% since the late 90’s, so it left sky high inflation behind before Chávez took office. So advantage Colombia, but with mitigating factors–the inflation problem is fundamentally more challenging in Venezuela than in Colombia. What causes inflation to be more endemic in Venezuela? Shifting oil prices, mostly–Venezuela exports 2.5 times more oil than does Colombia. Plus, in the mid-90’s, it experienced a financial crisis. The first question that needs to be answered is what on earth happened in Venezuela in 2002 and 2003. Essentially, there was a coup attempt against Chávez (to what degree the United States was involved is contested) followed by an oil strike the purpose of which was to force Chávez out of office. Neither effort was successful, and Chávez brought about a strong recovery in 2004. 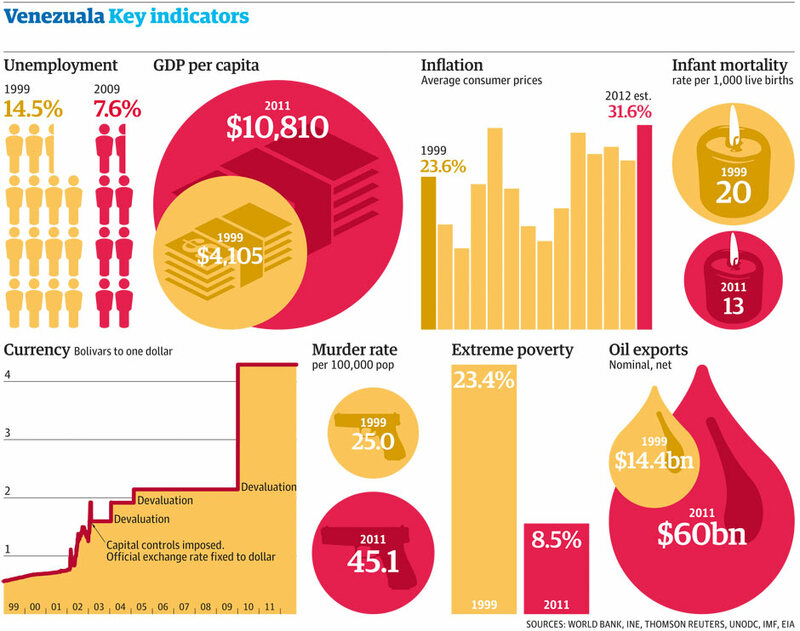 Post-2004, Venezuela posted annual growth rates around 8-10% compared with 5-8% in Colombia. Colombia did manage not to go into sustained recession during the global economic crisis, but Venezuela’s annual growth rate of around 5.5% exceeds by about half a point what Colombia has been doing lately (I have the luxury of being able to zoom in on the relevant segments of these graphs at the Trading Economics website, but it would be rather daft of me to post 6 different GDP graphs). I don’t think Chávez can be blamed for the coup or the strike–the remainder of the period, the Venezuelan growth rate has generally exceeded the Colombian by a small amount. Seems as though Chávez was fairly fiscally responsible during Venezuela’s boom years (04-08), at which point, to prevent a deep recession and prop growth up, he embarked on a policy of stimulus. Because Chávez had brought the debt to GDP ratio down by nearly half between 2004 and 2008, there was plenty of borrowing room available, so he was able to run deficits during the bust. Classic Keynesian economics done well. Colombia similarly tried to reduce debt during the boom years, though it seems to have focused more on preventing a return to higher debt levels than to stimulus since 2008. This shows up in its recent growth figures, which do not match those posted by Venezuela, as discussed above. Interestingly, both of these countries seem to have understood the basic Keynesian principle of reducing debts during boom periods better than the developed countries in which the Keynesian doctrine originally developed (I recall distinctly that the UK and the US both saw slightly increased debt to GDP ratios during the 04-08 period–a mistake by the Bush and Blair governments, respectively, and which has diminished the perceived scope for stimulus in those countries). Here we see that, with the exception of the coup and the strike, Venezuela has performed admirably in comparison with most of the other states in the region, though it admittedly has been hit harder by the global economic crisis (again, this is linked to its heavy oil exporter status). Another critique is that Venezuela is too dependent on oil, that Chávez over-invested in expanding oil production instead of investing in the wider economy, mortgaging Venezuela’s future to get growth today. This is a valid criticism–around 90% of Venezuela’s exports consist of oil. However, while the Chávez government had a mixed record in investing in the country’s nascent industries, it has made a considerable investment in the country’s human capital by improving literacy, access to education, infant mortality, healthcare, and so on. Whether that will provide a post-oil foundation or not remains to be seen, though. In sum, I do not think Chávez is worthy of hero worship, but nor do I think his policies represent any kind of disaster. What we had here was a broadly benevolent regime that improved the standard of living of much of its people. It did this rather unintelligently by simply selling lots of oil at the highest price it could get for it and then throwing this money around all over the place, and perhaps, in various ways, it could have invested smarter and longer-term. But the great impoverished masses of the Venezuelan people who would have had to wait for that wealth to trickle down to them, they are undoubtedly better off, at least for now. The full verdict on Chávez will not be known until the oil stops flowing and we see whether or not the underlying model is sustainable. In the meantime, however, I’m willing to give the system the benefit of the doubt in the interest of the Venezuelan poor and look to the next leader of Venezuela to make the critical economic moves in improving non-energy sectors. If I’m your average Latin American, I’d rather have spent the last decade in Venezuela than in Colombia, and I think that’s to Chávez’s credit. We shall see if the next decade proves as fruitful. Excellent discussion of Chavez that actually focuses on whether or not he improved the country, not just blind rhetoric that you hear most places. Chavez certainly wasn’t perfect, but overall he did a lot of good and greatly improved Venezuela especially for the poor. Thank you, that was precisely what I was going for, and I’m glad it’s achieved.